Nissan will cut its domestic capacity to 1.15 million units from 1.35 million per year and expects to produce 1.22 million vehicles in Japan in fiscal 2012, the daily said. TOKYO (Reuters) - Nissan Motor Co. will trim its production capacity in Japan by 15 percent next month, the Nikkei said on Thursday. The automaker will cut its domestic capacity to 1.15 million units from 1.35 million per year and expects to produce 1.22 million vehicles in Japan in fiscal 2012, the daily said. A rising yen has hit the export competitiveness of Japanese manufacturers. 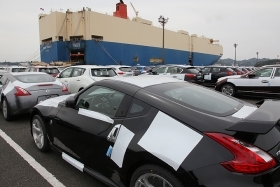 In January, Nissan said it would cut back on exports from Japan to reduce its exposure to the rising local currency. The automaker will suspend one of the two production lines at its key Oppama plant in Kanagawa Prefecture, without laying off any employees, the paper said. Nissan will stop the production of the Tiida in Japan, it added. At the same time, production will be ramped up in emerging nations such as China, Brazil and Russia, it added. The suspended production facilities at Oppama will be transformed into a prototype line designed to support the swift launch of operations at plants in emerging markets, the newspaper said.